Delivered Dallas 21/4/44; Hunter 30/5/44; Grenier 14/6/44; Assigned 709BS/447BG Rattlesden [IE-D] 19/6/44; landing accident with Malcolm Bounds 27/12/44; landing accident with Hal Kearney 29/1/45; (83m) Returned to the USA Bradley 5/7/45; 4168 Base Unit, South Plains, Texas 7/7/45; Reconstruction Finance Corporation (sold for scrap metal in USA) Kingman 9/11/45. A BIT O‘ LACE. 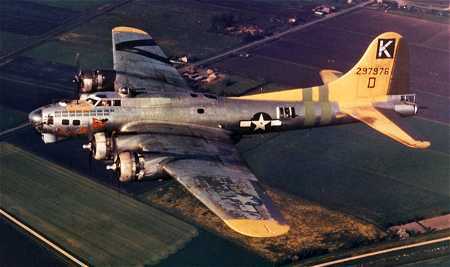 There is an almost-complete mission list for this particular B-17G available at https://www.flying-tigers.co.uk/2016/boeing-b-17-flying-fortress-new-models-and-august-bank-holiday-sale/.